How Is Solar Energy Used In Your Home? Home > How Does Solar Power Work > How Is Solar Energy Used? When buying solar power systems, it is super important to understand how your solar energy is used in your home. 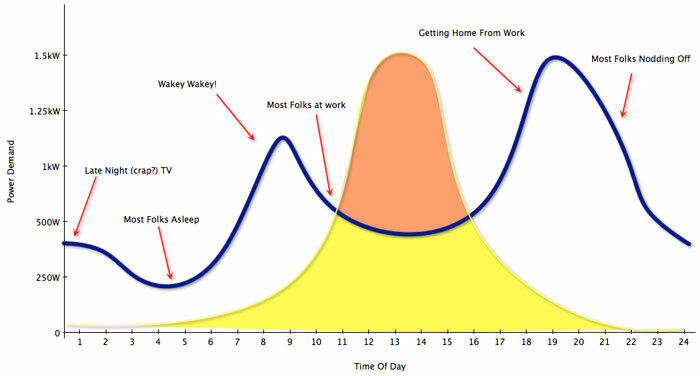 i.e how much electricity you currently use and at what times throughout the day you use it. The reason for this is that your usage habits will determine how much solar energy you export. Exported electricity is generally a lot less valuable to you than using it in your home. Expect to get paid 6-8c per kWh for exported electricity and pay out 25-35c per kWh to buy electricity from the grid. To minimise your losses from this horribly unfair situation you need to size your system to minimise exports, if you want to get the best return on your investment. Contrary to popular belief you can't just look at how much electricity you use every quarter and then size a solar system from that number. If a solar salesman tries that one – run a mile. 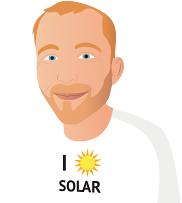 The solar sales person needs to have much deeper understanding of your usage than the size of your last bill. And so should you! So sit down, take a deep breath, and enjoy getting stuck into this short, explanation of how solar energy is used in your home. Trust me this stuff is important if you want to understand what you are getting yourself into! 2) exporting your solar electricity out to the grid (generating more than your house can use). This is an important distinction because how you use your solar energy will determine how much you get paid for it and also what system size you should buy. The blue line is the electricity use over 24 hours for an average home. The yellow line is the typical output of a 1.5kW system. The yellow area shows you the solar energy that is used up by your home's appliances. At these times of the day your home will use any solar electricity that is coming out of your panels before it draws any electricity from the grid, so you save money by using less grid electricity. The financial value per unit of electricity (or kWh) is simply what you pay per kWh for grid electricity. Typically 35c per kWh at time of writing (Jan 2015). But what about the solar electricity that we don't use in the home? 2) Exporting your electricity into the grid, building a credit. The orange area in the graph above is the solar power that is exported out to the grid. At these times of the day your solar panels produce more electricity than your household is currently using. That electricity flows backwards through your electricity meter and into the electricity grid. If your meter is configured to export energy (which it should be! ), then as your meter "spins backwards", your bill is credited. By how much? Well that depends on the laws in your particular state and when you get to exporting electricity the rules change in most states. If you are getting a pittance for the electricity you export, then you want to try and export as little as possible!. So it's really important to understand the details of the local electricity deals that you can get, which often vary from utility to utility. It’s also vital to get a written quote from your installer on how much energy they expect you will offset and export, at what rates, compared to what you consume. Check here to see the latest state by state solar feed in tariff information.